After much planning, it's launch time for the first mission of Autosub6000, our unmanned Autonomous Underwater Vehicle (AUV). Travelling at a speed of one metre per second, Autosub6000 will spend around thirty hours beneath the waves. Launched from a specially designed gantry, Autosub6000 splashed into the water and slipped elegantly away from the ship. Autosub6000 will map a target area on the seafloor where our other sensors indicate there are deep-sea vents. The video below shows the terrain where Autosub6000 will be surveying, which includes some steep underwater cliffs. The base of of Mount Dent (see April 3rd) is just visible in the distance as the yellow area in the video. 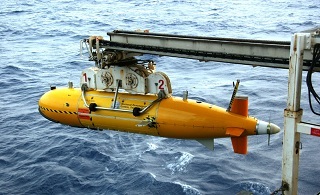 On this mission Autosub6000 is carrying two CTDs, an oxygen sensor, a multibeam sonar system for mapping the seafloor in fine detail, an Acoustic Doppler Current Profile (ADCP) to measure deep-sea currents, a Light Scattering Sensor (LSS) to detect the smoky plumes of deep-sea vents, an Eh sensor for detecting chemical changes in seawater from nearby vents, and, for the first time, a digital camera to take seafloor photographs. Autosub6000 is powered by rechargeable lithium-ion polymer battery packs and is completely independent of the ship. Rechargeable batteries mean that Autosub6000 can be ready for its next mission within six hours. Battery life depends on speed and the power demands of the equipment the vehicle is carrying - more sensors and cameras use more power. If power fades before the mission ends, Autosub6000 will come up to the surface. 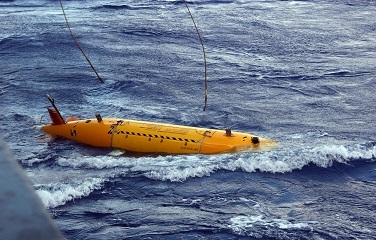 The Autosub team, led by Steve McPhail, will be monitoring its progress closely during this first mission, using acoustic communications. Although the vehicle is not remotely-controlled, the team can check the battery life and order the vehicle to abort its mission if necessary. Autosub6000 is torpedo-shaped for slipping efficiently through the water. Its hull displaces more than 3000 litres when is submerges. But only 30 lites of the vehicle, enclosed in titanium, is kept 'dry' to house all the electronics. When Autosub is hauled out of the sea at the end of its mission, about one tonne of water drains from it. Our expedition is taking Autosub6000 close to its limits: the terrain is rugged and the depth is near the maximum for the vehicle. By studying the maps we have already made of the seafloor, the Autosub team have programmed its 'way-points' - latitude and longitude targets that define the operating area for the mission - to avoid problem areas. But Autosub6000 also takes evasive action itself if it encounters unexpected cliffs or crevasses. Once Autosub6000 returns, the information it is carrying will be used to plan the first dive for HyBIS. 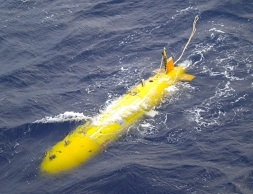 And while Autosub6000 is getting on with its job, we have been busy with the CTD probe, sending it down twice. The first time it collected samples for the physical oceanographers, Kate and Sara. The second dip was for chemists Doug and Carla, and molecular biologist Alex, using a Stand Alone Pump (SAP) to collect particles in the plumes gushing from the vents below. With the second CTD cast now on its way back to the surface, the remainder of the night will be a vigil for Autosub6000's return.